Hello everyone. 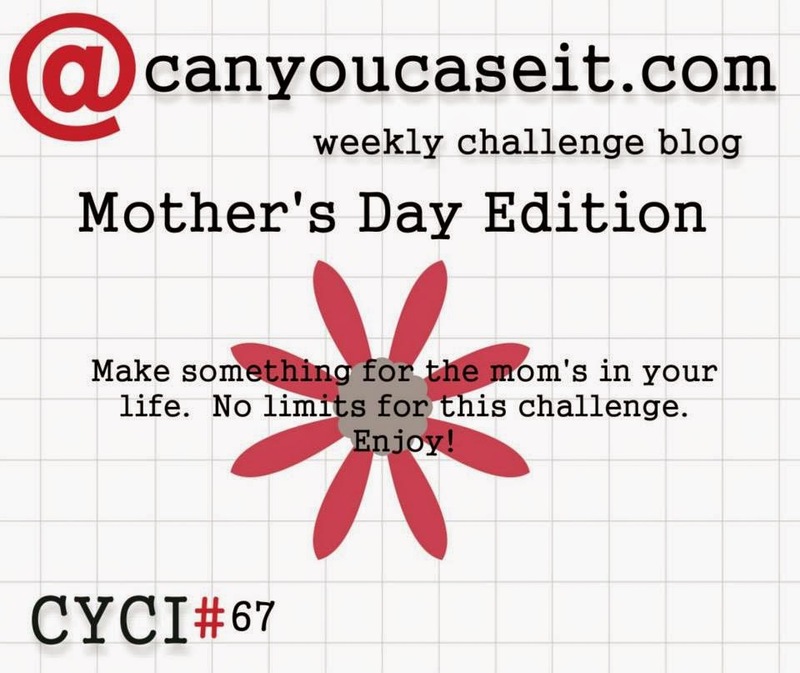 Thanks so much for all the comments and views to my post this past Sunday for the CYCI Mother's Day Inspiration card. While working on that card, another idea popped into my head - the card above. This time I used a 3" white art square from Inchie Arts. I love this product!! It is an artist grade matboard and I love how it stands up to any medium I might be using - dry to wet. I StenDoodled the umbrella in the same way as the previous card - traced the umbrella from the Rain stencil with a Copic Multi Liner. Then went back in with the Slices 6 stencil and then the Doodle It Inchie stencil - all from StencilGirl Products. Colored it in with my Inktense Watercolor Pencils and a water brush. The colors do not bleed on the matboard and get absorbed very nicely. I then applied some Diamond Glaze from Judikins over the umbrella and set it aside to dry. While it was drying, I stamped the Flowers in Bloom set from Sweet N Sassy several times with black archival ink. Colored them in with Tombow markers and a water brush. Then cut them out. When the Diamond Glaze was dry (after a few hours) I inked up the sides with Versamark and the dipped each side into Aged Gold Embossing Enamel from Stampendous and heat set. I loved how the gold looks against the black cardstock. I then adhere the art square to a piece of 4" x 8" folded black cardstock. Applied some pop dots to the back of the flowers I cut out and arranged them so they were coming out of the umbrella. Then I added a few sequins and cut a piece of white cardstock for the inside of the card. Then some stickles on the flowers. Done! Here is a look at the card from the side. 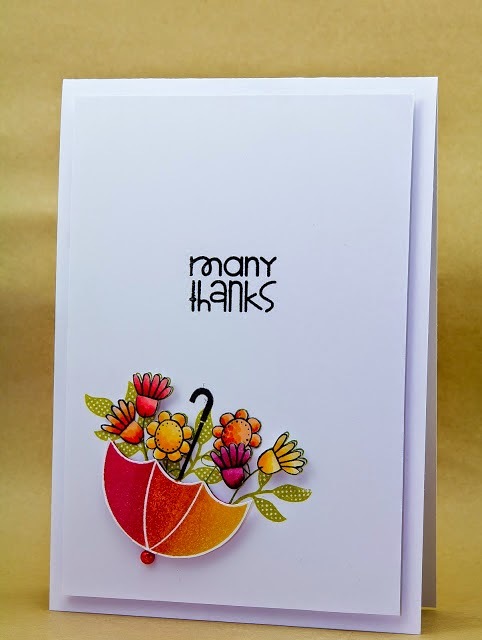 You can see the dimension that the card gets when using, not just the pop dots behind the flowers, but an extra layer when you use an art square by Inchie Arts. Hope you enjoyed this card. Please leave feedback and let me know! Thanks and hugs from Brasil. Today is Sunday, which means it is also Can You Case It day. 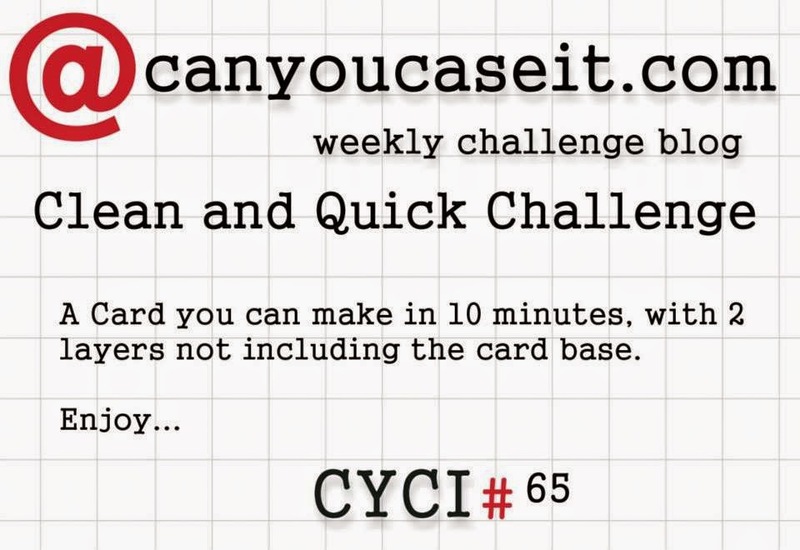 This week's challenge, CYCI No. 67, is all about Mother's Day. A few weeks ago I came across a card on Pinterest that I loved. As soon as I saw it, I knew I had to re-do it as a StenDoodle with a few of my favorite stencils from StencilGirl Products. It has been ages since I picked up a stencil and it felt great to be using a few again. I am really pleased with how it came out and I hope you guys are too. Below is the card that inspired me. You can click on the photo to be taken to the original blog post. Start with an A2 base of white cardstock. Take another piece of the same white cardstock and die cut the largest die from the Die-namics Stitched Rectangle set. 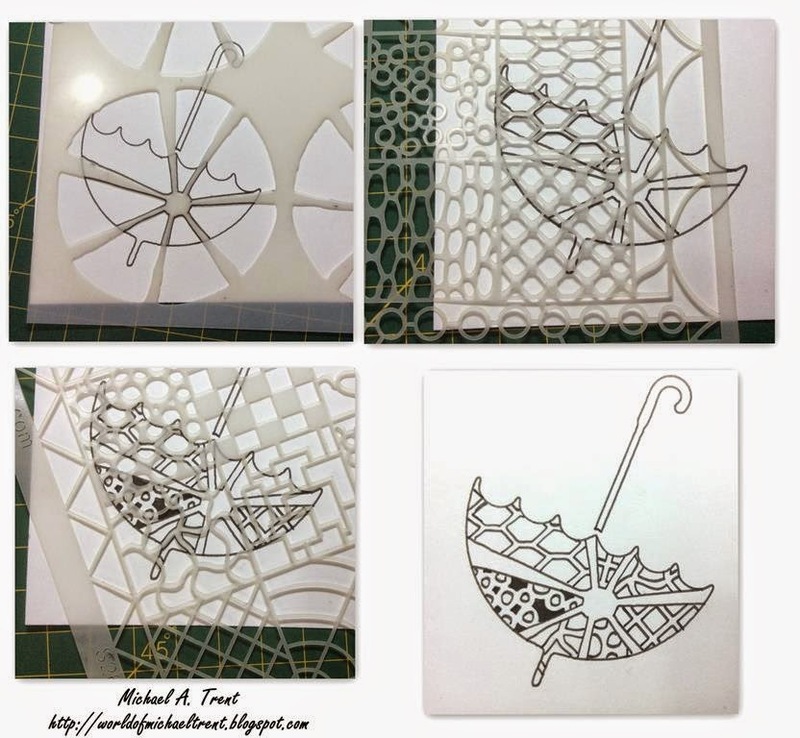 Place one of the umbrellas from the Rain stencil on the cardstock and trace with a permanent black fine tip marker (i.e. Sharpie, Copic Multi Liner, Faber Castell Pitt). If you plan to color with Copics, you MUST use a Copic Multi Liner pen! Now make a mask with the same umbrella and a sticky note or scrap of paper. Place over the umbrella you traced. Then, stamp your images so that the flowers are coming out of the umbrella. You might want to use a stamp positioner for this part too. Do one side, then the other. 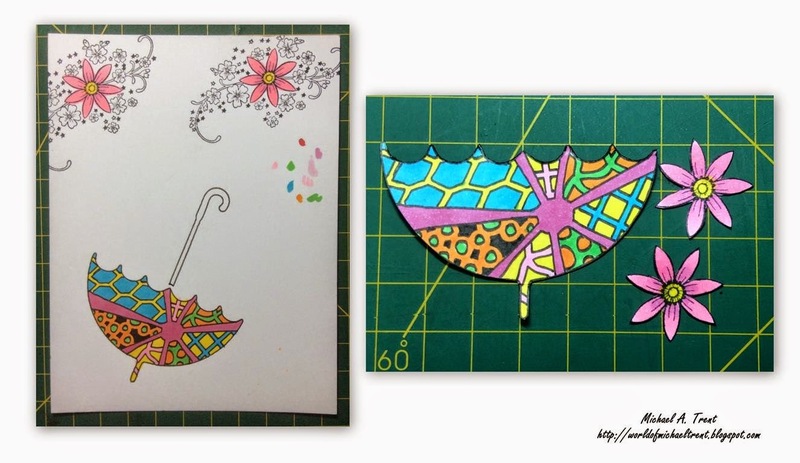 On a piece of scrap white cardstock, stamp the flower image twice and trace the umbrella. Place the Slices 6 stencil over the umbrella and trace the sections with the permanent marker. Then place different parts of the Doodle It Inchie stencil over each of the sections and trace those designs. 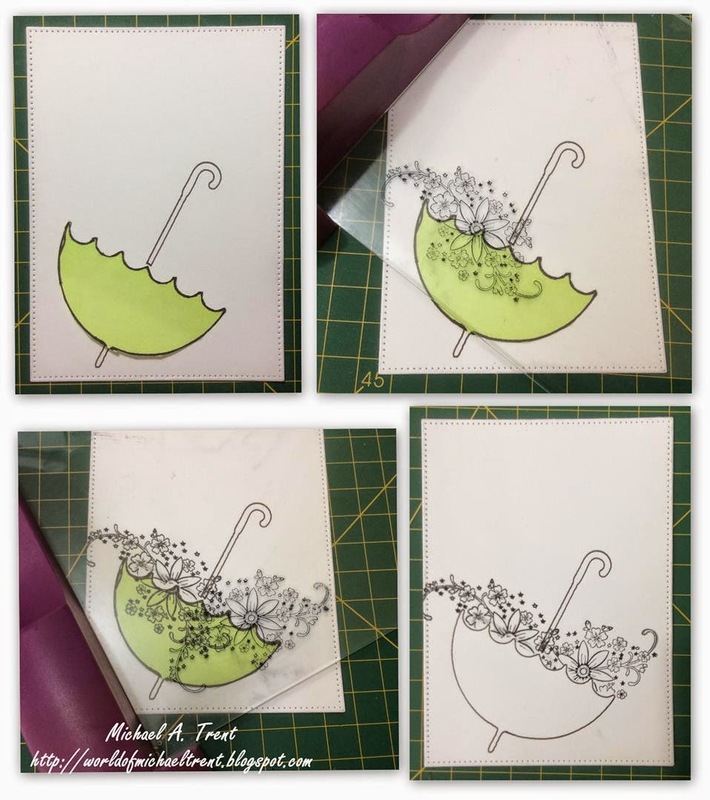 When done - color the umbrella and also color the large flower from the images you stamped on the scrap cardstock. Then cut the umbrella and the large flowers out with a scissor. Stamp phrase above umbrella. Then adhere the white cardstock with the stitched border onto a piece of colored cardstock (optional) and adhere that to the card front. 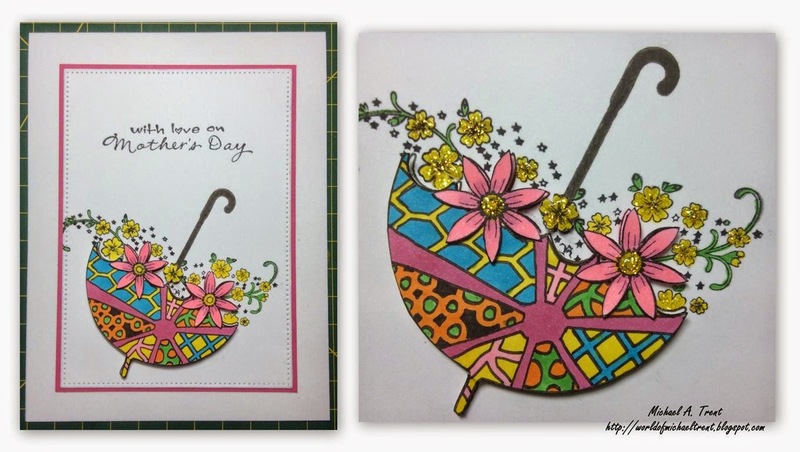 Then, using pop dots, adhere the colored umbrella to the card front and the small flowers you cut out. Add Stickles if you want to make it glimmer a bit. Now just write a nice message inside and send it out! Hope you liked this card. Don't forget to enter your own card into the challenge!! Click HERE for the details! Good morning and happy Sunday to everyone. Because it's Sunday, this means another Can You Case It Challenge. This week is no. 66 and, once again, it was my choice to do whatever I wanted. I love these weeks!! There are also 3 new amazing designers that have been added to the CYCI Design Team - Maggie Mata, Tina Riddle, and Holly Stene! You can read more about them over at Can You Case It and make sure to enter a card in the challenge no. 66 - just click HERE! Below is the card I made this week's challenge. I love this card because it can be used for Mother's Day (which is coming up quickly) or for any other occasion (just change the phrase) or leave the phrase off completely and use as a quick note card. And, you can make it in under 10 minutes! I started with an A2 Whisper White cardstock base (Stampin Up). Cut a piece of Perfect Plum cardstock (Stampin Up) at 4" x 5.25" and adhere it to the card front. Cut another piece of Whisper White cardstock in 3.75" x 5". For the jar, flowers and stems, I used 2 different sets from PaperTrey Ink - Friendship Jar Summer Fillers (jar and flowers) and Friendship Jar Fillers (for the stems in the water). I did NOT want this image to be centered on the card. I wanted it off center and off the page. So I stamped the jar first so that a small portion was off the cardstock. Then I masked above the jar and stamped the stems portion from the flowers in the Fillers set so that they would look like they were sitting in the water. Then I stamped the flowers from the Summer Fillers set over the top of the jar. 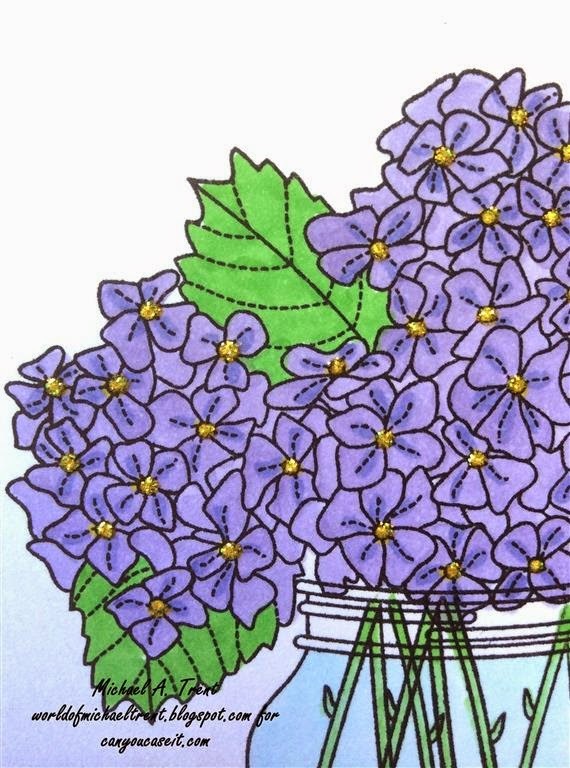 For coloring - First I used I used G14 (Apple Green) on the stems. Then I colored the water in the jar with B000 (Pale Porcelain Blue). Then I used G07 (Nile Green) and G14 (Apple Green) on the leaves, and BV00 (Mauve Shadow) and BV04 (Blue Berry) on the flowers. Finally a dab of Y08 (Acid Yellow) for the center of each flower and then I went back and put a dab of Yellow Stickles over the Y08 for a bit of shimmer. Then I stamped the Best Wishes phrase (Vintage Labels, Stampin Up - retired) on a piece of Whisper White cardstock and layered it on a piece of the Perfect Plum. Glue to card front and then place a few pop dots to the back and adhere to the card front. That's it. Really a very easy card to make. I hope you will join us this week and enter an easy, less than 10 minute card, using whatever stamps and papers and colors you want. Make sure to enter it in the Can You Case It No. 66 Challenge. And check out all the other fantastic creations by the rest of the Design Team Members!! Thanks for stopping by and hugs from Brasil. Hello everyone! 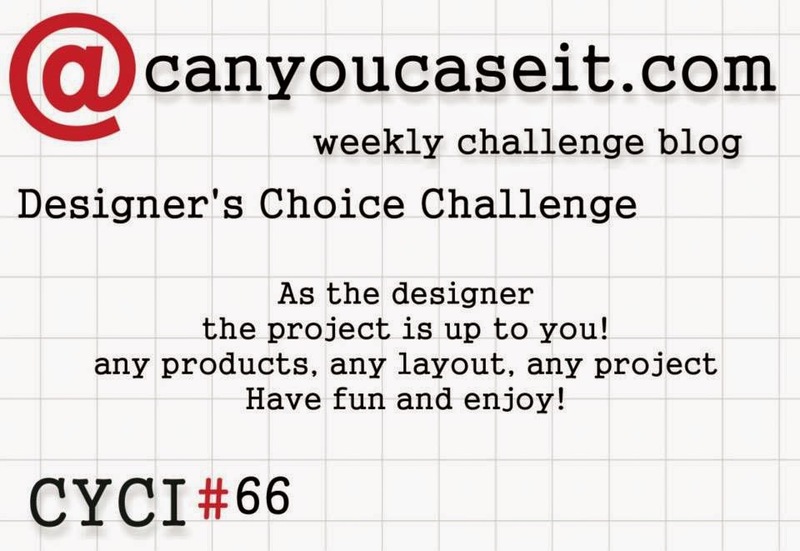 I am thrilled to announce that Can You Case It has asked me to become part of their Design Team for the next 6 months. That means [insert gulp here] that I will be making at least 1 card per week - and blogging about it. I hope everyone joins me on this new journey. I think it is going to be a fun ride! For my first turn here - for the Can You Case It Challenge No. 65 - I had to make a card. Any card. Using anything I wanted. No restrictions. Well, other than the fact that I had to make it in under 10 minutes! WHAT?? Me?? Make a card in under 10 minutes? It takes me an hour to figure out what stamp to use! But I did it!!! 1. 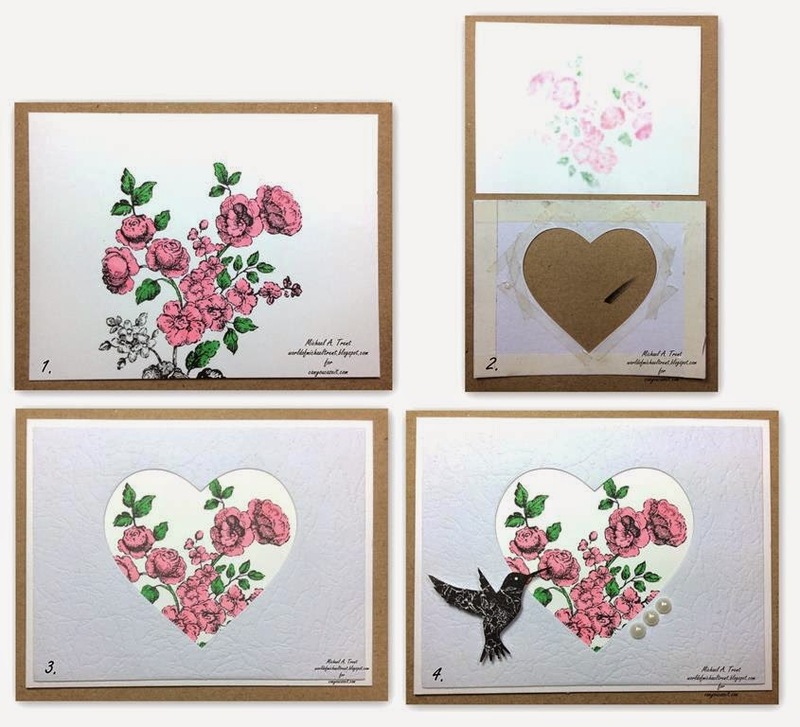 Place the heart die on the textured cardstock and run it through your die cut machine. Please the piece of white cardstock behind this piece and "lightly" trace the heart with a pencil. Stamp the large flower image from the Elements of Style set - inside the heart. I used Memento Tuxedo Black because I knew I would be using Copic markers. Also, using a stamp positioner can help but it is optional. 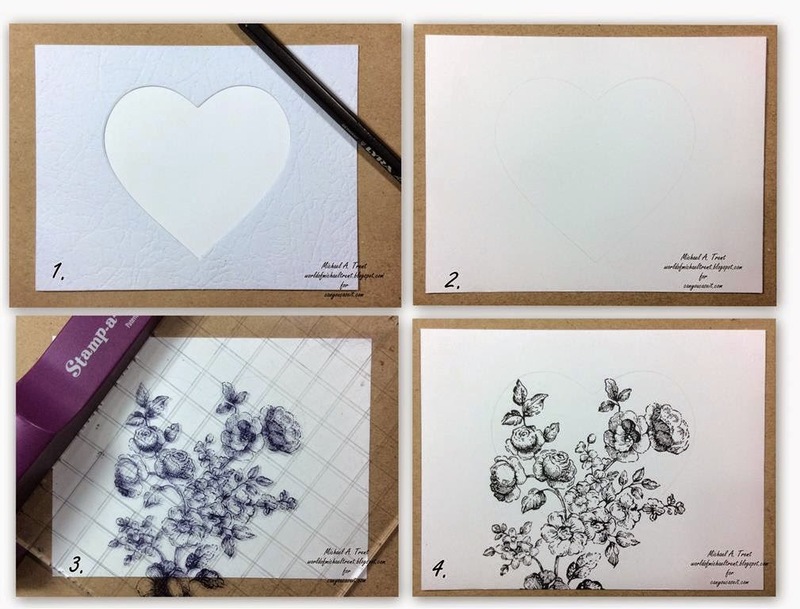 Do not worry that the image stamps outside the heart as you will not see this once the card is done. Then erase the pencil mark. 2. Color in the image. Because this card has to be done in less than 10 minutes, all I used was Copic Pure Pink (RV23) on the flowers and Copic Emerald Green (G05) on the leaves. Then glue the textured piece over the colored image. I used double sided tape. I then stamped the hummingbird (also from the Elements of Style set) with the Memento Tuxedo Black ink, cut it out, applied some pop dots to the back and adhered it to the card front. I then applied some Clear Wink of Stella Brush over the hummingbird to give it some shimmer and adhere 3 half pearls to the right side of the heart. Here is the final card. The inside can be any phrase you want from "I Love You" to "Happy Mother's Day"! I hope that you enjoyed my Design Team card for this week’s Can You Case It challenge. Now head on over to the blog and check out what the rest of the design team has done and make a project of your own to share in the gallery! You could win! Thanks again for taking time out of your day to come and visit! Piece of white cardstock - 3 7/8" x 5 1/8"
Piece of textured white cardstock 4" x 5.25"